My daughter wanted a Monster High cake for her 9th birthday since she love those dolls so first I made a square cake and a round one. The square cake I cut out pictures of the dolls from the boxes the dolls came in then taped them to toothpicks and used them for cake toppers and the zebra on the side is the edible cake paper from Walmart. I used the cake spray paint to say the balk/white zebra paper purple and the round cake I put ontop of the square and I tried to make a dimons design in pink and blue sparkle jel because it matched the napkins but it was hot out and melting and didn’t have time to refrigerate it when making it so it’s sloppy. 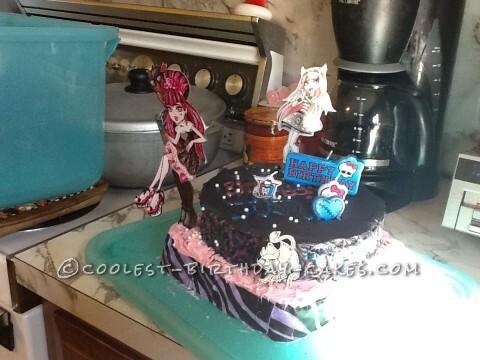 Then I bought the Monster High candles and the kids loved the cake. It was a big hit. They were asking me to make them one.